This week, we have a bunch of products on Geektest for you. These first 2 will help you out when you find your power is running low on the plethora of USB powered devices you now have in your life. First up is the Intocircuit Power Castle – a 4.8A Output Dual USB External Battery (aka a Power Bank) so you can charge up your devices on the go. I collected a number of power banks over the last few years, and they each work with varying degrees of success. This one though, is one of the most impressive I’ve used. First thing you notice is the solid construction. The entire shell is (expect the ends) is covered in brushed metal, so it feels sturdy and looks great. Given you’re likely to taking this out and about, that’s no bad thing. On one side there is an LED display which shows power level, charging and discharging status. It also comes with 2 USB ports, which will let you charge any two USB-charged devices at top speed simultaneously, partly thanks to it’s SmartID technology, which can identifying what specific device is attached, and ensure it’s outputting the maximum charging efficiency and speed. The massive 15000Ah capacity means 1 charge should give you the ability to recharge your smart phone around 4-7 times (depending on the phone), and an iPad more than once. The whole unit costs less than £30, and is well worth the money if you’re looking for a solid, reliable battery backup. 9/10 – Extremely impressive power bank at a really good price. 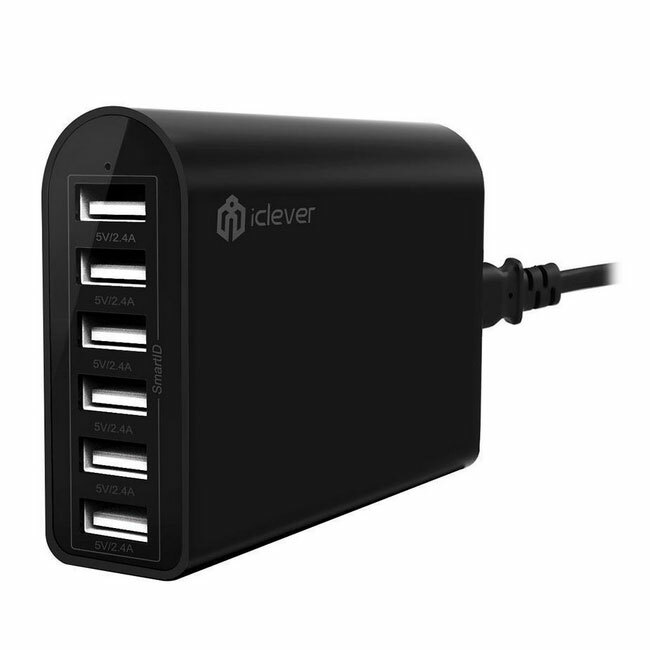 The next item we had up for a Geektest is iClever’s 6 Port USB Charger. Like the Power Castle above, it use SmartID Technology, so it can identify the device that’s attached, and maximize the device-charing efficiency. It’s small, light-weight, and lets you charge up to 6 devices at once. Each port outputs 2.4A, so you could happily use it to charge 6 iPads, if you happen to be Mr. Moneybags, or just a really obsessive Apple fan. It will of course charge any other USB devices too. I’ve been using it for weeks now with my Nexus 5 and 7 with no problems at all. Even used it to charge the Power Castle mentioned above. It’s also extremely well put together, and covered with a lovely smooth matte black layer of that rubbery plastic stuff, so it feels good to carry around. It runs on a standard wall socket, so you just need to plug it in and get charging! It runs AC 110-220V input voltage makes it ideal for international travel. Overall, I really can’t fault it. 10/10 – Great little charger for all your USB devices. ← Win Ant-Man IMAX Tickets by finding… Ant-sized Ant-Man tickets across the UK!